Vibrio bacteria occur naturally in many marine environments, BUT they are not related to pollution. 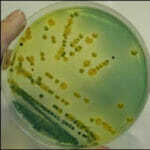 Although most Vibrios are benign, two species, Vibrio parahaemolyticus (V.p.) and Vibrio vulnificus (V.v.) have been associated with human illness. 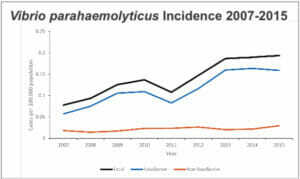 According to the latest statistics, less than one percent of food-borne illness is related to Vibrio, while the vast majority are associated with vegetable, chicken and meat products. 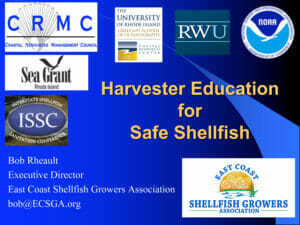 The official training curriculum for Rhode Island shellfish growers and harvesters, updated regularly. This pdf of a PowerPoint presentation covers Rhode Island Dept. of Environmental Management/ Interstate Shellfish Sanitation Conference regulations, Vibrio risks and rules, and aquaculture-specific concerns. The National Shellfish Sanitation Program (NSSP) is the federal/state cooperative program recognized by the U. S. Food and Drug Administration (FDA) and the Interstate Shellfish Sanitation Conference (ISSC) for the sanitary control of shellfish produced and sold for human consumption. The purpose of the NSSP is to promote and improve the sanitation of shellfish (oysters, clams, mussels and scallops) moving in interstate commerce through federal/state cooperation and uniformity of state shellfish programs. 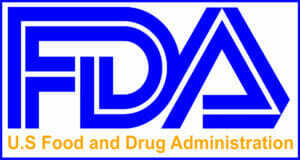 Under international agreements with FDA, foreign governments also participate in the NSSP. Other components of the NSSP include program guidelines, state growing area classification and dealer certification programs, and FDA evaluation of state program elements. This 5-minute video shows how Dr. Rachel Noble and her team at the University of North Carolina at Chapel Hill aim to revolutionize early detection and alert systems for contaminated seafood and ocean waters. Easy-to-use kits will identify harmful bacteria in water and shellfish in only two hours (vs. the current 24 hours), significantly benefiting North Carolina's tourism and seafood industries. SafeOysters.org is a gateway to Vibrio vulnificus information for health care providers, food and health educators, consumers, fishermen and commercial processors. This article by Bob Rheault describes what went on at a September 2017 V.p. workshop focused on reviewing recent research and control plans. This article by Andy dePaola that ran in our June 2017 newsletter describes how the numbers of Vp illnesses linked exclusively to shellfish in the Northeast declined after rapid-cooling controls on oyster harvesting began in 2014. An opinion piece by Katherine Gustafson from Forbes.com. In May 2016 the Center for Science in the Public Interest (CSPI), sued the Food and Drug Administration (FDA) in federal court to force the agency to regulate Vibrio vulnificus (Vv) in shellfish harvested in Gulf Coast waters and sold for raw consumption. ECSGA Executive Director Bob Rheault offered his take at that time on the CSPI’s efforts to regulate consumers' access to raw shellfish. But in November 2016 the FDA denied CSPI's petition, stating that both shellfish growers and the agency had made significant progress on reducing illnesses and deaths stemming from Vv. 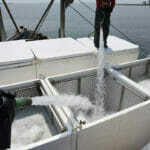 Rheault commented on the decision in an article by Christine Blank for SeafoodSource.com.